Start with a green base like spinach, kale, lettuce or romaine. Make it bright by adding seasonal fruits and vegetables. Give it some crunch by adding croutons, sunflower, seeds, nuts or tortillas. Power up with protein like chicken, fish, beef, eggs or tofu. Dress it up with your favorite cheese and salad dressing. This formula, provided by the folks at Redpack, inspired my ‘Clean the Fridge Out’ Salad we had for dinner the other night. 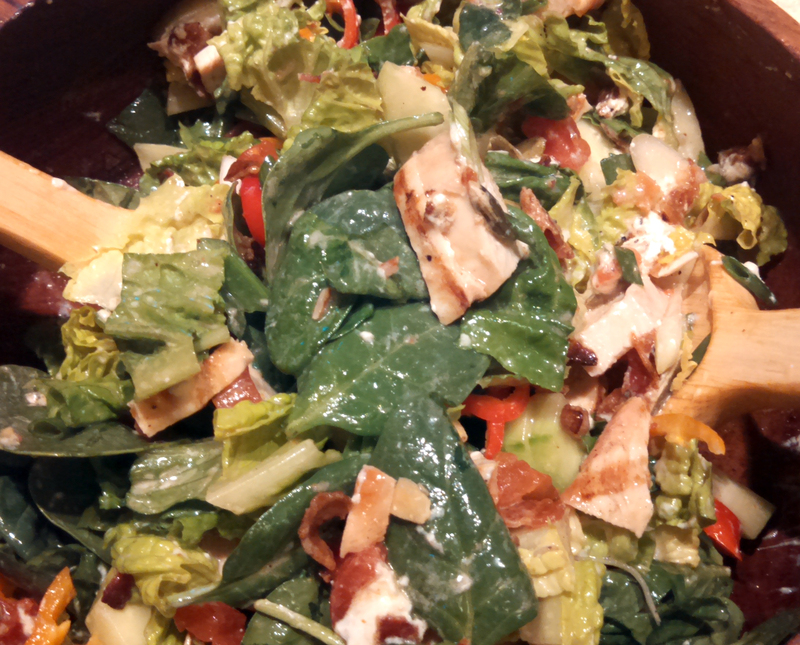 I started with a green base of romaine and baby spinach. Then I added some sweet red and orange peppers, cucumbers and some beautiful green onions that I picked up from the farmer’s market over the weekend. Then I “Tossed in the Flavor” by adding about half a cup of drained Redpack petite diced tomatoes. What a great idea! We spend a lot of weekends at our camp in the Adirondacks and I usually end up making a salad of some sort. I usually bring lettuce, cucumbers or peppers. These are things that don’t damage, or bruise, easily. Traveling with fresh tomatoes, however, is a pain in the neck. From now on, I am going to bring canned, diced tomatoes with me to add to salads and sauces or whatever. Why didn’t I think of this??? I’m allergic to nuts so I added pepitas (pumpkin seeds) for crunch, bacon (three slices in the microwave for 2 minutes) and leftover chicken breast. I had some black pepper chevre for the cheese and dressed the salad with Italian dressing. This formula truly makes the perfect dinner salad. Now through July 2 Redpack is giving away a total of 3,000 reusable grocery totes (you know can never have too many of them!) on their Facebook page as part of their “Toss in the Flavor” promotion. Winners will be randomly selected each week. There’s also going to be a Grand Prize winner selected who will receive a Gourmet Picnic Gift Basket worth $350. 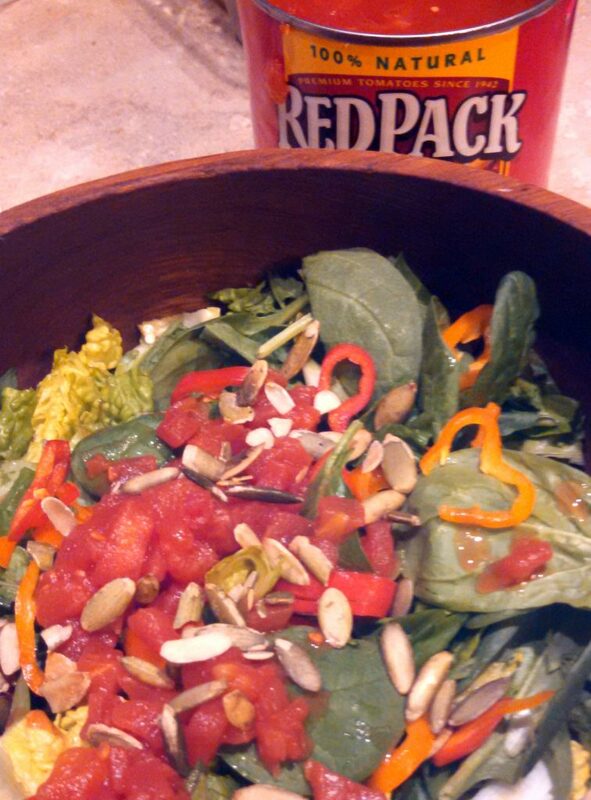 Be sure to ‘Like” Redpack on Facebook to be eligible. You can also visit Redpack’s Pinterest for more salad inspiration, like their Melon Prosciutto Salad, Raspberry Shrimp Salad, Peach Chipotle Salad and Chicken Blueberry Chopped Salad. In the interests of full disclosure, Redpack sent me three cans of diced tomatoes and the “Toss in the Flavor” sweepstakes information. I do not work for Redpack and have not received any other compensation from them. That being said, I’m still annoyed that I didn’t think of adding canned diced tomatoes to salad myself because it’s really good and super practical for camping.